Large glass areas let a lot of natural light into the room. Additionally they offer fantastic, unobstructed view of our garden during the day. As early as at the stage of designing a house it is advised to make planning for a sliding door to eventually enjoy friendly door design and smooth operation every day. Lift and slide HST doors offer both modern and optimal solution for accessing your terrace or garden. The HST system takes advantage of all the available space – it can be designed as up to 6 m wide and up to 2.5m high and the maximum weight of a single leaf could be as much as 400 kg (Salamander HST – learn more). Such parameters of HST doors enable to design a glass area of up to 15m2! Advanced design of hardware and rail tracks guarantees smooth movement of door sliding panels. 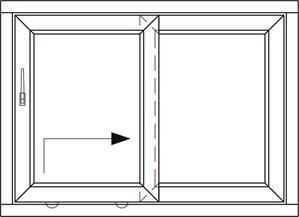 HST sliding doors are available in several different configurations of leaves and fixed panels (see the basic Salamander diagrams below). The choice is limited mostly by our imagination and functionality our new doors could offer. Thermal insulation is another key factor that should be borne in mind. Our HST doors achieve favorable thermal parameters: heat transfer coefficient Uf is as low as 1.1 W/m2*K. Thanks to innovative gaskets, double glass units and up to 5 chamber profiles, these systems are successfully applied when passive house standard is required (find out the advantages of Aluplast doors). The threshold is plastic reinforced with fiberglass and filled with special foam to provide outstanding thermal protection. Aikon Distribution offer also includes wooden HST system, which provides both functionality and astonishing style and elegance. Unique effect provided by the combination of timber joinery and large glass surfaces is becoming increasingly popular in today's construction industry. Various features and advantages of a lift and slide system make it much more than just an access to a terrace or balcony. It also enables unobstructed view of the outside. Huge amounts of sunlight that enter interiors make us feel better and energised.